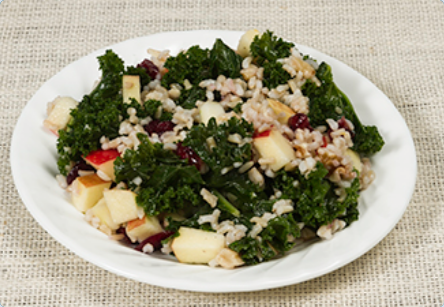 Enjoy spring produce with this nutritious, low-calorie salad made with quinoa, pecans and kale or spinach. 1Cook whole grain according to package directions. Cool. 2Whisk together oil, vinegar, honey, salt, and pepper in a large bowl..
3Stir apples, nuts, dried fruit, and whole grain into dressing. 4Toss greens with other ingredients. Substitute 2 cups of chopped fruit (strawberries, grapes, oranges) for the apples. Do not give honey and nuts to infants under one year of age. Nutrition analysis uses 1/8 teaspoon each of salt and pepper. Nutritional Facts available at the above link. Posted in Recipes. This entry was tagged healthy, heart health, kale, nutritious, pecans, quinoa, recipes, seasonal. Bookmark the permalink.